“Woohoo! Friday Flash Review Time! No doubt you’re all punch-drunk on the Royal Wedding festivities and/or hiding in your airing cupboard until it’s all over. I refuse to cover the Royal Wedding in any way because I am b-o-r-e-d of it, which is why I’m in the Isle of Skye looking at otters and mountains. At least I hope I’m looking at otters and mountains and not having to hibernate in my remote cottage because there’s a gale blowing/a psychopathic fugitive on the loose/a killer sheep stalking the tourists. I have no idea at this particular point because, you see, I’m writing this well in advance. Hello future me! So, onto Dr Darren McKeown’s ‘Naked Truth’ Face Renewal Mask. As is the way with my Friday Flash Review, I am going into this first-time trial without any preconceptions, hang-ups or prejudices. I have no idea who Dr Darren is, how much this mask costs or what the ‘Naked Truth’ range is. I’ll say one thing though: it looks expensive. Oh, it doesn’t say! What it does say is that the mask “only contains real, proven ingredients, handpicked by Dr Darren McKeown” and that he “will always use the most effective ingredients he can find and be honest about what each one can do”. So what’s in the mask, then, and what can it do? I’m slightly confused by this; is it a chemical exfoliant or is it a mechanical exfoliant? Hmm. A ‘renewal mask’ suggests that the action is chemical – but I can’t see any ingredients on the box that suport this. Mind you, I’m not a chemist, so I could be wrong! Once my Flash Review is over I am going to seek scientific help on this one, but for now, let’s have a little play with the mask! More ‘scrub’ than mask, this product smells incredible. A lot like a blood orange body moisturiser I bought in Arizona once. (As you do.) The scrub particles are reasonably fine, but it’s the cream itself that I like – it’s a light, whipped texture that’s really pleasing to use! The instructions tell me to apply to cleansed skin, leave on for 10-15 minutes before rinsing off. No word about ‘massaging’, which is weird considering it has scrubby bits in that need massaging about a bit! I give the mask a bit of a scrub about anyway – a gentle scrub about because I’m not keen on scrubs as exfoliants, I prefer non-mechanic exfoliants because I worry that I’m scratching my skin! After fifteen minutes, I rinse and the creamy mask comes off very easily. It hasn’t really dried or set so that makes life easier! My skin is very soft and smooth, feels quite ‘tight’ but also, weirdly, quite moisturised! How this happens I have no clue, but I’m guessing (wildly) that the Apricot Kernel OIl has something to do with it. Thumbs-up for this one, although I do have a tiny bit of sensitivity on my cheeks, probably due to the fact that I very rarely test out mechanical (scrubby-scrub) exfoliants. But at what high ‘Doctor’ price does this mask come in at? As a little sneaky test, I emailed Dr Darren McKeown about this mask using my weirdo email so that he wouldn’t know it was me. (Don’t we all have a weirdo email?) I didn’t ever in a million years think that he would get back to me – there are PRs and helplines and Superdrug staff members to deal with these kind of questions! or physical exfoliant and what the active ingredients are in it! Thanks from a confused and scientifically ignorant person! And Dr McKeown very graciously sent me quite a detailed email back telling me all about the mask and its ingredients! Whatta guy! He’s a cosmetic doctor, by the way, and performs all kinds of facial miracles – something I’m not particularly interested in trying, quite honestly – but who knows? Maybe one day! “The main objective of the mask is to exfoliate, hydrate, and boost the skins radiance. The first two are relatively easy, but boosting the skins radiance can be a challenge…” In the end Dr McKeown chose “a combination of magnesium, copper and zinc” to help “boost cell metabolism and improve skin radiance”. What I loved about Dr McKeown’s email was that not once did he make overblown claims or assertions – no defensiveness or sales ‘spin’. He seems like a very honest and balanced person, trying to create products that will be as effective as possible. He doesn’t promise miracles and in his email he mentions the difficulty in measuring results scientifically when it comes to issues such as ‘radiance’. The truth, for once -how refreshing! 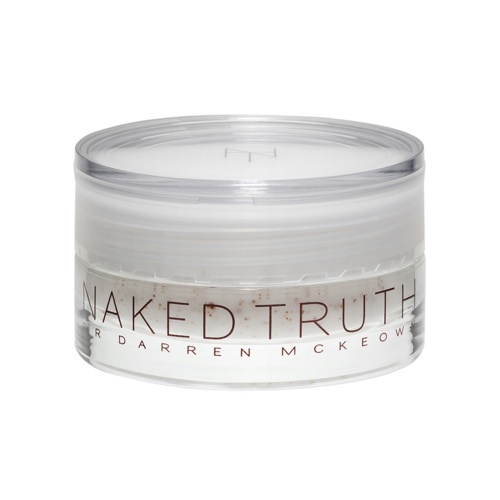 Dr Darren McKeown’s Naked Truth Face Renewal Mask costs £21.99 from Superdrug, only online HERE and then nationwide from mid-May.